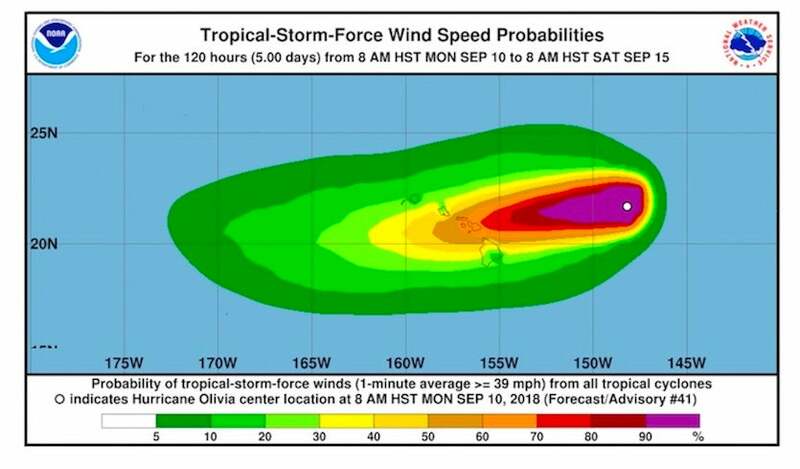 Above: Probabilities of tropical-storm-force winds across Hawaii from Hurricane Olivia, which is expected to pass through the islands on Wednesday, September 12, 2018. 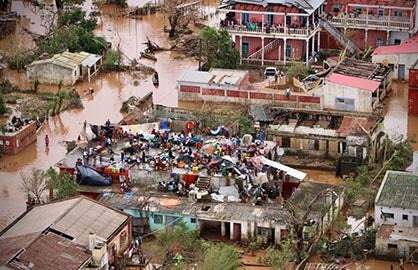 (Olivia was downgraded to a tropical storm on Monday afternoon, after this image was produced.) Maui County and the northern Big Island were projected to have better-than-even odds of tropical storm winds on the predicted track. Image credit: NOAA/NWS Central Pacific Hurricane Center. Fearsome Hurricane Florence, which zoomed to Category 4 strength on Monday ahead of schedule, is just one of several tropical cyclones that will likely or potentially strike land over the next week across the Northern Hemisphere. The picture is still in flux, but here’s a roundup of what we know as of late Monday afternoon. 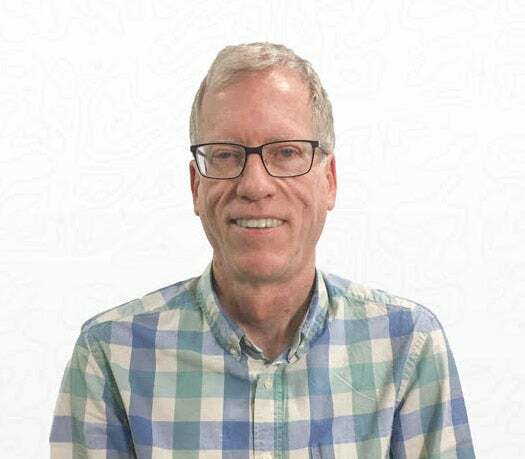 For much more on the extremely serious threat posed by Florence to the U.S. East Coast, see the detailed posts filed by Dr. Jeff Masters earlier today on Florence’s multiple threats and on the storm-surge risk in particular. Downgraded to a 70-mph tropical storm as of 8 pm EDT Monday, Olivia is still on track to make weather history Wednesday as one of just five named storms to pass directly over a Hawaiian Island, assuming that Olivia doesn’t fall apart completely or thread the needle between islands. Track forecasts have been very consistent in taking Olivia on a west-southwest bend through the island chain on Wednesday, most likely across or just south of Maui, which could put Maui on the stronger north side of the storm. A tropical storm warning is in effect for Maui, Maui, Molokai, Lanai, Kahoolawe, and the Big Island, with a tropical storm watch for Honolulu. No named storms have ever made landfall on Maui (with landfall defined as the center of the storm reaching land), and none of the two hurricanes and two tropical storms known to have made landfall in Hawaii have approached from the east-northeast. Olivia was looking anemic on satellite Monday afternoon, and wind shear is predicted to ramp up into the 20 – 30 knot range by Tuesday night. This will push some very dry air into the heart of the storm and help decouple the low- and mid-level circulations, even as Olivia passes over progressively warmer water. Olivia was predicted by the Central Pacific Hurricane Center to be a strong tropical storm as it reaches Hawaii on Wednesday, although that might end up being generous. The greatest impacts will be locally high winds and heavy rain (perhaps more than 10”) on whichever island(s) Olivia passes near or directly over. Because Olivia will be weakening and won’t be stalling out, prolonged and widespread heavy rains are not expected. Figure 1. Visible GOES-16 image of 95L taken at 3:30 pm EDT Monday, September 10, 2018. Image credit: NOAA/RAMMB. The trough creating high wind shear over 95L is forecast to weaken and move out of 95L's way over the next few days, creating a lower shear environment in the Gulf of Mexico that may allow development to occur. The 18Z Monday SHIPS model predicted that wind shear would be moderate Tuesday – Friday, SSTs a very warm 30°C (86°F) with high ocean heat content high, and 95L embedded in a moist atmosphere with a mid-level relative humidity of 70%. All these factors favor development. The 12Z Monday runs of two of our reliable models for forecasting tropical cyclone genesis, the European and UKMET models, predicted that the system would develop by Friday, as did about 40% of the 50 members of the 0Z Monday European model ensemble. 95L will likely move inland over the Texas or northern Mexican coast on Friday or Saturday, so it will not have a lot of time to strengthen over the western Gulf. In their 8 pm EDT Monday Tropical Weather Outlook, NHC gave the system 2-day and 5-day odds of development of 30% and 60%, respectively. The next name on the Atlantic list of names is Joyce. Figure 2. 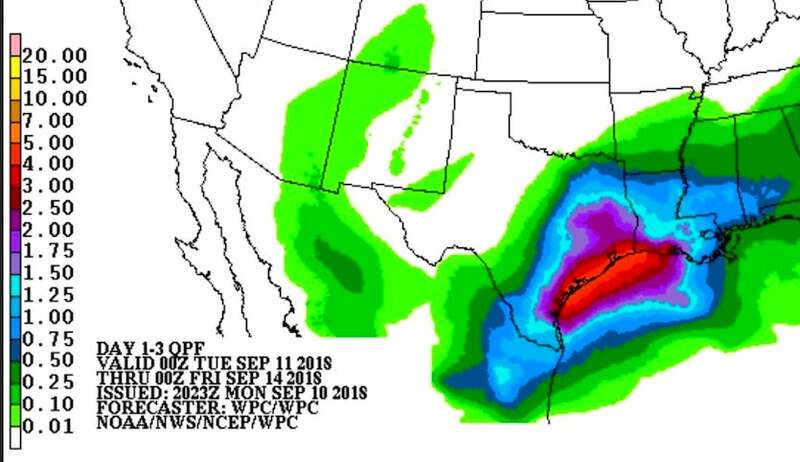 Rainfall outlook for Texas from the NOAA/NWS Weather Prediction Center for the 72-hour period starting at 8 pm EDT Monday, September 10, 2018. Regardless of whether or not 95L develops, it will bring heavy rains to the coast of Texas late this week. Image credit: WPC. Regardless of whether it becomes a named system, 95L has the potential to bring 5”+ of rain to coastal Texas, on top of multiple rounds of showers and thunderstorms already being triggered across southeast Texas this week from a stalled midlatitude storm. Widespread rains of 3" to 5”, with locally 5" - 10”+, are possible along the Texas coast ahead of 95L through Thursday (see Figure 2 above). Tiny Hurricane Isaac continues to chug westward at 14 mph across the central tropical Atlantic. As of 5 pm Monday, Isaac’s top sustained winds were holding at minimal hurricane strength, or 75 mph, making it a Category 1 storm. Isaac’s compact nature is evident in the wind fields: tropical-storm-force winds extend out only 45 miles, mainly to the north of Isaac, and hurricane force winds extend only about 10 miles. 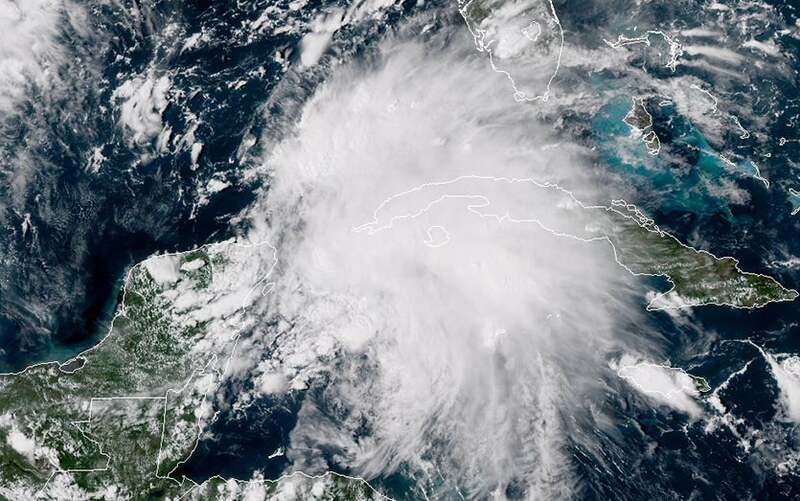 Isaac appeared disorganized on satellite Monday evening, but with showers and thunderstorms (convection) pulsing and upper-level outflow improving toward its north and west. Convection will likely increase through the night, in keeping with the usual nocturnal maximum within tropical cyclones. Figure 3. Infrared satellite image of small Hurricane Isaac (left) and much larger Helene (right) as of 2235Z (6:35 pm EDT) Monday, September 10, 2018. Image credit: tropicaltidbits.com. Most of the top track models keep Isaac heading toward the southern Leeward Islands, which were hit by multiple devastating hurricanes just last year. Because Isaac is so small, it has the potential to both strengthen and weaken quickly, but the hurricane’s size also limits the breadth of any impact, which is good news for the Leewards. Some runs of the HWRF model have predicted that Isaac might undergo a burst of quick strengthening—the 12Z Monday HWRF run brings Isaac through the islands as a Category 2 storm—but several other models suggest Isaac will be merely a tropical storm as it reaches the Leewards. In either case, Isaac’s impacts will be limited in both time and space. The ridge steering Isaac will be influenced by the evolution of Florence, which leaves open the possibility that Isaac might angle north before reaching the Leewards and avoid reaching any islands. The UKMET model has been most consistent with this early-recurvature scenario. A large number of GFS and European model ensemble members also recurve Isaac, mainly after it enters the eastern Caribbean. These later-recurvature paths could bring Isaac closer to the Greater Antilles by next weekend or early next week. The consensus of operational models is to keep Isaac tracking westward into the central Caribbean, which is NHC’s forecast as of 5 pm Monday, but confidence in this outcome is a bit lower than usual. Figure 4. Infrared satellite image of Hurricane Helene as of 2220Z (6:20 pm EDT) Monday, September 10, 2018. Image credit: tropicaltidbits.com. Hurricane Helene is taking a stab at Category 3 strength in the remote Eastern Atlantic, where at least its prowess is harmless. At 5 pm EDT Monday, Helene’s top sustained winds were 105 mph. Sea surface temperatures are seasonably warm, around 27°C (81°F), and wind shear is quite low (less than 10 knots through Tuesday), so Helene could make it to Category 3 strength on Monday night or Tuesday before the hurricane encounters slightly cooler waters and more wind shear on its sharply recurving path toward the northwest and north. On satellite, Helene appeared quite potent Monday evening, as intense thunderstorms wrapped around the south side of a distinct eye. Only a handful of hurricanes have attained Category 3 strength east of 40°W longitude, most recently Ophelia (2017), so hitting this mark would put Helene in an elite group. Helene is expected to weaken to tropical-storm strength by Friday and could approach the Azores by Sunday or Monday. Figure 5. 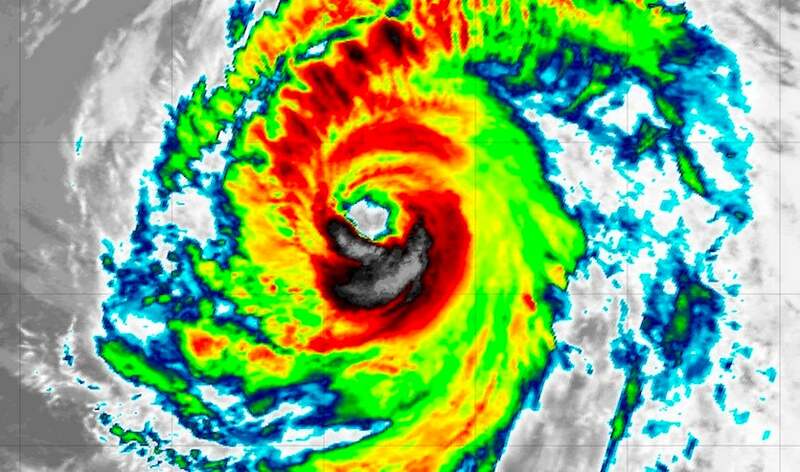 Enhanced infrared satellite image of Typhoon Mangkhut as of 2130Z (5:30 pm EDT) Monday, September 10, 2018. Image credit: UW/SSEC/CIMSS. Typhoon Mangkhut spared Guam and Tinian its worst, but passed over the tiny island of Rota, as it swept through the U.S. territory of the Northern Mariana Islands with top winds of around 110 mph at around 5 am EDT Monday (7 pm local time). 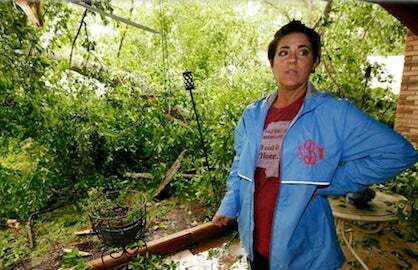 To the south and north of the storm, wind gusts topped 80 mph in Guam and 60 mph in Saipan, as reported by weather.com. Power was knocked out across both Tinian and Rota, according to FEMA. Mangkhut will be gathering strength over the next couple of days as it passes over deep warm water with low wind shear. 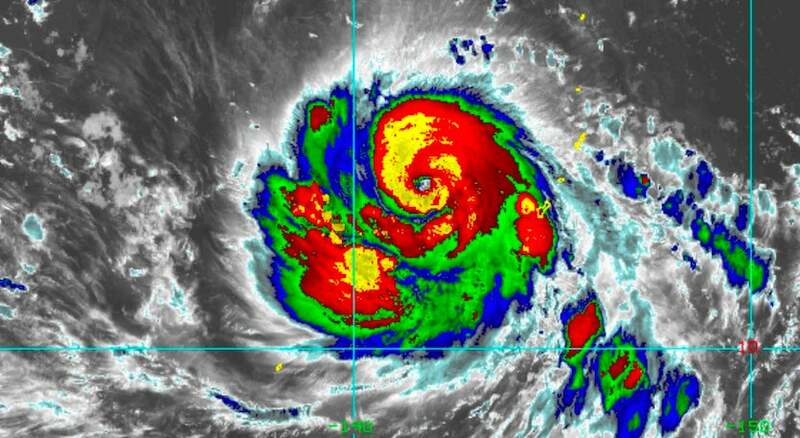 The storm is predicted by the Joint Typhoon Warning Center to be a Category 4 super typhoon by Wednesday. On a broadly arcing path toward the west-northwest, Mangkhut is expected to pass between the Philippines and Taiwan, and it will likely approach the coast of China as a powerful typhoon—possibly near or just north of Hong Kong—on Sunday. 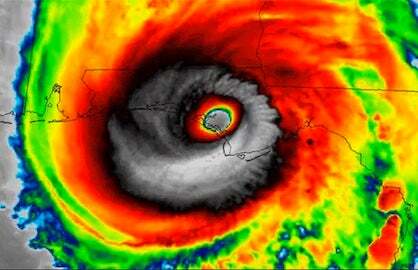 Dr. Jeff Masters wrote the 95L section of this post.